These incredible Skyscraper Lilies grow so tall they look like trees! Formed as a consequence of hybridisation between Oriental and Trumpet strains of lily. Every flower carries a wonderful heady perfume and up to 20 individual blooms. Grow all 5 in large pots about 15cm apart, or in groups in garden borders. Winter hardy, they will last for many years. Supplied as a pack of 5 bulbs. This collection comprises of 5 top sized bulbs, the same as used by commercial flower growers in Holland, of stunning pink coloured Robina. These incredible Skyscraper Lilies grow so tall they look like trees! In their first year they will reach up to 1.5m (5ft) tall, but in future years, once they are fully established, they will get even taller up to 6 or even 7 foot tall eventually! 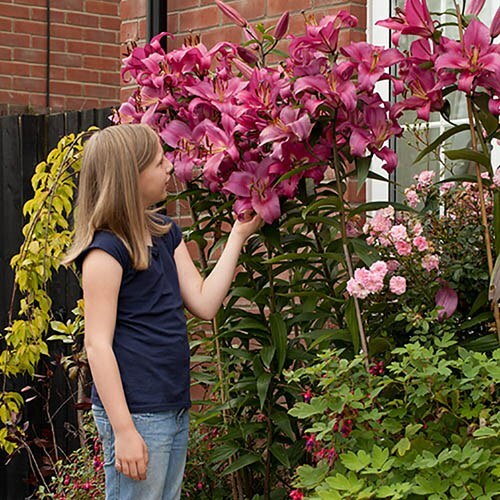 These large flowered beauties arise as a consequence hybridisation between Oriental and Trumpet strains of lily hence the marriage of both species characteristics. Every flower delivers a wonderful heady perfume and each individual stem can carry well over 20 blooms, which can measure well over 15cm (6in) across.